Erected/to the memory/of DONALD CAMPBELL cart/wright Bogallan who/died the 24th May 1866 aged/87 years also his spouse/HELEN CAMPBELL who died/------aged-----years/and his son DONALD who died/the 2 Aprail 1818 aged 3/months/and his daughter/CATHERINE who died/18th March 1858 aged 31/and his son WILLIAM/who died the 14 June 1865/aged 30 years. Picture Added on 22 February 2008. 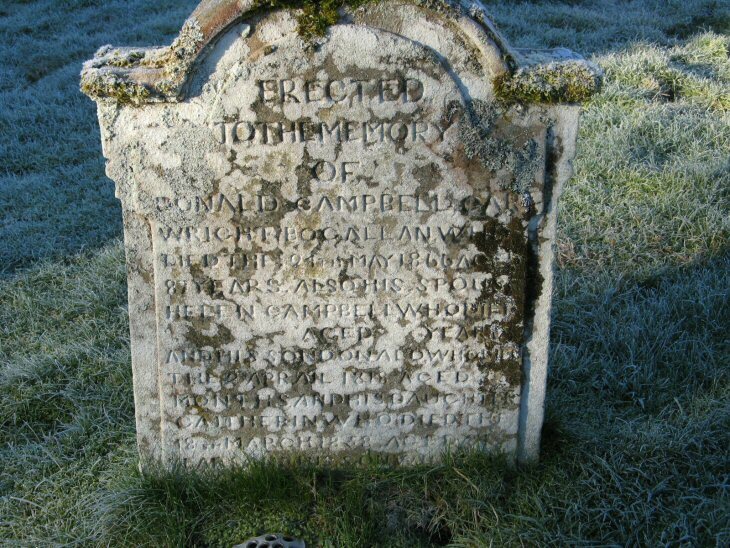 Helen Campbell died on July 28th 1870 aged 74 at Bogallan Knockbain SR D Knockbain 1870. Added by Roberta Taylor on 06 September 2008. Added by Donald J. Campbell on 22 June 2013. Donald Campbell, parents were Kenneth Campbell and Margaret McDonald. Helen Campbell, parents Alexander Campbell and Margaret Young. Added by Colin D Campbell on 09 October 2018. Added by Christine Campbell on 10 October 2018. DNA y chromosome matched to Donald J Campbell (posted above) we have a common "adam" of Kenneth and Margaret Mcdonald. Our linkage goes as follows and is fully documented Colin James, William, William, John, John, Kenneth - Kenneth, Donald, Kenneth, Donald Morrison, Hugh Mcgregor, Donald John. Happy to help anyone that believes they are related. Added by Colin D Campbell on 10 October 2018.